“What is this now?”, you ask. Unless you’ve seen some recent tweets I posted, you might be wondering where the classic chapter covers have gone. During the last month I’ve been working on the printed edition of Bookwyrms and I made some stylistic decisions which I believe will improve the quality of the comic. Among them is the removal of the point-of-view focused chapters, which didn’t add as much as I had expected storytelling-wise and implied having a lot of very short chapters. This didn’t allow me to work on Bookwyrms illustrations for chapter covers, and although I do like the idea of the library card covers, I really wished to have unique, illustrated covers for chapters. So I converted the story so far into 4 chapters, which will have their own double-page illustrated covers in the printed edition. These first 4 covers won’t make it to the online edition, (although I am planning on sharing them somehow in the future) but today, with the start of Chapter 5, the illustrated covers will be posted on their own as a regular update. This is why today I am only posting the cover, and next week I will post the first page of the chapter. Since the illustrations take quite some time I believe it is fair that they get posted this way, and it will also help me at the time when volume 2 gets printed (the fact that I will have all the chapter covers ready as well, I mean). 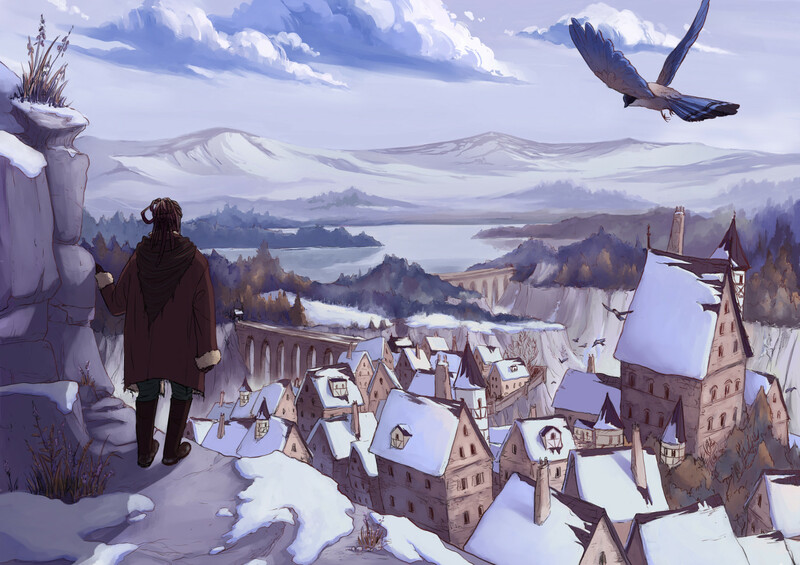 After finishing arc 1 of Bookwyrms last month, the story continues up in the North. You can check page 1 (the map) to see just how far Ivergor is from Cwen. To give you an idea, those light mountains in the far background mark the border with Galagard. I’ve missed posting pages a lot and now I can’t wait for next week. I hope you are all doing well! Beautiful. I’m super jealous of your art skills. Aww, I’m so glad you liked it that much! Thank you! goodbye to the cute library cards. loved the idea as much as you probably. hello to the amazing chapter covers. Thank you! And… we’ll see about that, hahaha! This is soooo pretty!! I really like the chapter cover idea. Though the library cards were cute, this is super epic! We haven’t seen this character before, right? I like the endpaper idea. I just about gasped out loud when this page loaded. All your artwork is lovely and it’s easy to tell how much effort you put into them. But this page – especially the bird – blows me away! You captured the bird in flight so perfectly and the entire scene has a three dimensional look to it! I think the fact that features closer to the viewer are darker and sharply defined, while far back is softer and more blurry is what helps. This is just so very gorgeous!